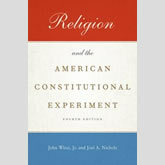 John Witte, Jr. and Joel A. Nichols have published the fourth edition of their classic classroom text, Religion and the American Constitutional Experiment, which is now available from Oxford University Press. The new edition is updated through the 2015 Supreme Court term, and remains calibrated to serve as an ideal classroom text for courses in law schools, divinity schools, graduate schools, and upper level college courses. Justin Latterell, CSLR's Alonzo L. McDonald Senior Fellow in Law and Religion, led the research and review effort with several research assistants, including CSLR alumnus Drew Stevens (JD 2014) and current CSLR students Max Eichelberger (JD 2016), Jessica Floyd (JD 2016) and Peter Wosnik (JD/MTS 2017).